I was considering buying a microfibre cloth but my twitter buddy CHM has saved me quite a lot of money! The tip she gave me was really simple, use an old tshirt instead of a towel.I know, I bet you have read this before too, just never tried it..........you should! 1. It was a lovely thick fabric which soaked up the water really well. A thin tshirt may not work as well and cotton as a fabric is ideal for drying. 2. I squeezed out each braid gently and my hair went from wet to just slightly damp in seconds. 4. I can envision that if my hair was free, the cotton top would have cut the air drying time to around 2-3 hours. I did try previously to use a paper towel as suggested by reader Kadiane, but I am a tree hugger. The paper towel really does work better than the cotton top but for me, the cotton top has top environmental marks being both recyclable and reusable. The microfibre cloth purchase is postponed indefinitely. How about you, do you air dry your hair or do you get bored and just blow dry it? Have you tried the old tshirt method? I use a microfiber towel from the automotive section. Works like a charm and I don't use it for anything else. I remember someone saying they used a Sham-wow to dry their hair. My hair is no longer that long so I never got to try it, but it makes sense to me. I air dry, when I was in PA due to the cold weather I would blow dry on low to speed it up. Going outside in cold weather with wet hair isn't fun. Great tip! I have a T-shirt that I've dedicated to hair drying duty as well. I use a 100% cotton, men's, white tank style undershirt, and I like it because it's not too thick. After washing my hair, I generally use it to gently squeeze the excess water from my hair before the styling process. Thanks for the tip. My hair is in an awkward phase right now. I'm kind of depressed. I twisted my hair 2 days ago and my hair was super hard due to coconut oil. Bleh! A lost a lot of hair. I have not used that oil for a while and forgot how to use it. I had oiled my hair so much that it reached my scalp and my seborrhea itchings started to bother me so....i had to wash my lovely curly twists the next day( yesterday). I cornrowed them to keep them stretched. Did not use the paper towel. Result: My hair is style wet this morning, the hair did not take any curls from the cornrow...and i'm fed up. Gnan!!! An old t-shirt could have done the job. I feel like i have not fully come to peace with the way my hair looks like cuz when twists are in poytail the roots at the forehead seem so fuzzy no matter what i do ( at least 1 inch of fuzzyness). I never hold my twist in pony because of that. Unless i do not have a choice...like today. It looks good on kimmaytube because she has looser curls, but not me. I don't know if i should just accept the look or if it is an unkept look. How can it be an unkept look if i did all i could do? What is unkept and what is our nature ? If i was sure about that look being normal, I would work on accepting it but....i don't know. Till i have a answer i'll be condemn to let my twist fall around my hair to hide the roots witch means extra time for styling. Help!!!!! I use a microfiber towel since they are pretty cheap at discount stores. I have used t-shirts in the past and I still use them when I dye or henna my hair, but I have locs and I have found that the microfiber towel dries them faster. I use a t-shirt too!! One day I couldn't find a clean towel so I used a one white t-shirt instead. It worked perfectly and did not snag any of my hair. I haven't owned, or personally operated a hair dryer in over 4 years.....If I want it blowdried, someone else has to do it. I used to go to the hair dresser's about once a month,and they would towel/ blow dry. Recently I haven't used heat in 7 months. I squeeze, and allow to air dry. Mind you it's not always easy/ convenient/ pretty,LOL, there have been days when I went a little heavy on the leave in conditioner, and my hair looked grey, but I ususally wrap it with a silk scarf throw on a hat, and a couple of hours later it's fine. I've used a cotton T-shirt for my own hair and it worked like a charm! I loved it, but then I did a little remodel of my bathroom and couldn't look at an T drying in my pretty bathroom. ;) Once the novelty of my bathroom has worn off and the weather turns colder, I'll think about bringing it out again. My bang is dried (the wet front twists were braided) and released as a side swipe (?) bang. No more insecurity. my question remain. Is it normal that the 4c loose roots feel unkept while pulled back ? Am I the only one? I never blowdry--I'm afraid. I always braid my hair and let it dry that way. This gives my stretched hair and leads to less tangles. I just bought two microfiber hand towels at a dollar store (Yay!). I used them to dry my hair and I'm in love. I will try the old t-shirt method soon. Thanks for all the comments! The microfibre towel that I looked at cost around $30-$45. I guess it is not that expensive but in my book anything that costs over $10 has to justify itself. Kadiane, you are asking the wrong person because I like fuzz lol. I love the t-shirt trick but I have to agree with Katie, having a damp t-shirt hanging around your bathroom is not that cute. To solve this problem I decided to cut-up oversized tees into rectangle shaped hair towels. Works like a charm! and yes, i use the tshirts as well--perfect!!! @Kadiane - don't be depressed, just be patient. I happen to love coconut oil, but you just have to learn how much to use and when. I didn't read that you used anything else on your hair, which may explain your results or rather the lack of hold/curls you were expecting. I guess I should have first asked why you were using the coconut oil to begin with? I'm assuming you want a better twist out. Start with moisturized hair, I think I'm right in saying oil does not moisturize the hair. Water and water based products provide moisture. A leave-in conditioner is a good place to start. (You can search this blog if you're unsure about what it means to keep your hair moisturized.) Next, you need something to provide 'hold'. Although, some people may just use a leave-in for their twist-outs; I'm not sure about that. I use shea butter/coconut oil mix I blend in my kitchen; a little goes a long way. I apply a tiny amount down the shaft and definitely at the ends. Everyone's hair doesn't like shea butter. So you'll have to play around and find something that provides 'hold'. Some people use gel: store brought, aloe vera or flax seed. And there are all kinds of products in the store from light to heavy that will work; depends on your hair/preference. As you are twisting your hair, you want to make sure the ends are smooth. I use my hands, others use a denman or even a small tooth comb. 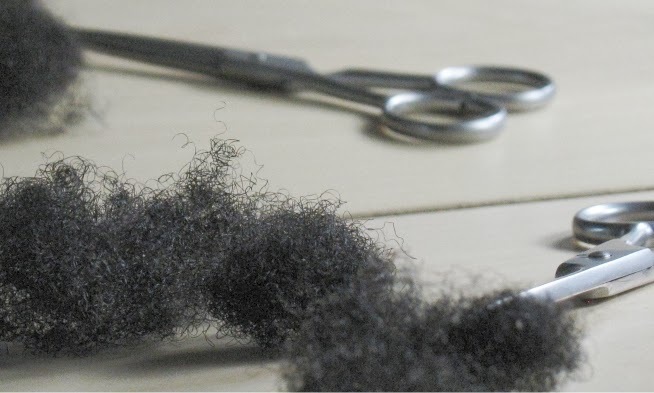 When you take your twist out, carefully undo the ends don't just break the twist open as is tempting to do. You can separate the twist as much as you desire, but the more you touch them the higher your chance of frizz. Some people use a pick to lift the roots. I use a combination of shaking my head and just using my hands because frizz doesn't bother me. But I will say, if my hair is moisturized well and I was careful undoing my twist, I don't experience that much frizz. And you're right, there is a certain level of acceptance of your hair. There's no 'normal' - it's just however you prefer to wear your hair. Start with learning the balance between moisture and protein and you might need to read up on split ends, just to make sure you have a healthy head of hair on your hands. Spend more time learning to accept/love your hair (through education/research) and less on finding a magic product. Don't go broke and don't give up! @ Kadiane - to me, unkept would appear like when you see dust and stuff in someone's hair so don't you worry :) and besides, I have never seen anybody 100% perfect except on a photoshopped picture, so don't be overly harsh on yourself. Lol.I like fuzz too except from the one i described. I think the girls are right I probably have to go deeper in the hair acceptance. I'll definitely try the cotton thing. I moved and did not have my usual towel paper around and did not think about anything else to replace them lol. I get my microfiber towels at TJ Maxx and Marshalls for about $7-8. You can find them on drugstore.com for around $12-15. I do keep a blow-dryer for emergencies, like coming home soaking wet in the middle of the night in winter in a snow storm and your radiators are broken. But I have never used it in years, and I would go a long way to avoid blow-drying. It is tempting at times, but then I remind myself of how broken my ends used to be back when I blow-dried. I swear by my t-shirts! I've been using them to dry my hair for over a year now. I bought a microfiber towel that was a little pricey imo and I didn't like it on my hair. It would always snag my hair. My coils always manage to get caught in between the loops (stitch pattern). Ha, leave it to my hair to tangle on anything it can get its coils around lol. No problems with the t-shirts though! from Malva: It is very helpful for me to read your drying time in braids. How do you manage this and a style? I have seen the "our hair routine" post at Happy Girl and am trying to incorporate this into my life. Could you post your daily/weekly styling schedule? Do you have a regular schedule??? I try to use coconut oil one night, wash then detangle the next morning, let air dry in braids (another day goes by as you mentioned), then style. My hair is happy, but the process takes 3 days and I am not always loving the drying-in-braids style. Any advice or suggestions? Thanks much! I like my hair pretty wet and after reading about the benefits of using a microfiber towel I got the bright idea to use the casing (it's almost like a little duffle bag) that microfiber sheets come it. I just use it to soak up excess here and there if need be. Does gel made from boiled flaxseeds penetrate hair? What are the benefits of it? I use the t-shirt method occasionally but I dry my hair using indirect heat sitting under the hair dryer weekly. After drying I roll my hair using 2 and 3 in rollers from Sally's with some setting lotion and dry for 20 min. My hair comes out blown out semi straight and manageable. my microfiber towel cost one dollar at target. it is dish towel size and works perfectly for my hair. they often have microfiber towels for the different holidays. i bought mine in several different colors, for the easter holiday, lol. I used to air dry my hair, but that was before I gave birth and had more time on my hands so I would wash it on Friday night or Saturday morning and air dry it so that it would be ready for church on Sunday. Now that I have my boys I can only wash my hair when someone else is in the house which is usually Saturday after noon which means I have to blow dry so that it's ready for church the next day. Thx for the info...everything on ur blog is so informative and I really appreciate how ur use of simple terminology so that the average person can understand what ur saying...but I'm curious...doesn't cotton break ur hair off (hence why we r supposed to sleep on silk/satin)...won't drying with the t-shirt cause breakage? The microfiber towel I got from a dollar store snagged my coils and left lint in my hair. Now I use an black cotton t-shirt (purchased from the same dollar store). It's great for drying my hair and dosen't snag or leave lint behind in my hair (even if it does...I can't see it). yep - its so about using a t-shirt. I just use one from out my drawer. amanda - Liv is right - cotton is absorbent and a tshirt has a much smoother surface than a towel.